This was part of a trip with CARE USA where we visited an NGO called Udaan/Join My Village. The tour was funded by the Bill & Melinda Gates Foundation. It was an unexpected pleasure to meet my friend, Michael Pelletier, back in India as Deputy US Consul at the reception. Thanks to this trip, I have become interested in girl-child education, community engagement in change, and public health (maternal mortality, infant mortality). The tour bus pulls into a dusty lane in rural Mewat, two hours outside New Delhi. About a dozen Americans get out and make their way into a small residential school, built under the auspices of Udaan (a Hindi word meaning fly), a programme that educates girls. The humanitarian organisation Care USA has brought a high-level delegation, including congressional chiefs of staff, policymakers, donors and officials from the US Agency for International Development (USAID) to witness grassroots-level change in India. The visiting group shuffles into the school courtyard. Some 30 girls, 11 to 14 years of age, clad in loose tunics and salwar kameez, flash welcoming smiles. Their heads are covered with pastel hijabs. In ringing, confident voices, the girls introduce themselves in Hindi. The Mewat region where the school is located has an interesting Hindu-Muslim history. The 20 villages the school serves are inhabited by an ethnic group called the Meo. They were Hindu Rajput warriors who were converted to Islam by Saint Moinuddin Chishti about 1192AD. Even though the villagers are Muslim, they cling to their Hindu folk tales, rituals and cultural identities. As Muhammad Musa, the chief executive and country director for Care India explains, educating girls in rural India is not simply a matter of building schools and getting girls to attend. It also involves understanding the historical and cultural norms of distinct ethnic and tribal communities and changing deep-rooted attitudes towards education and gender. 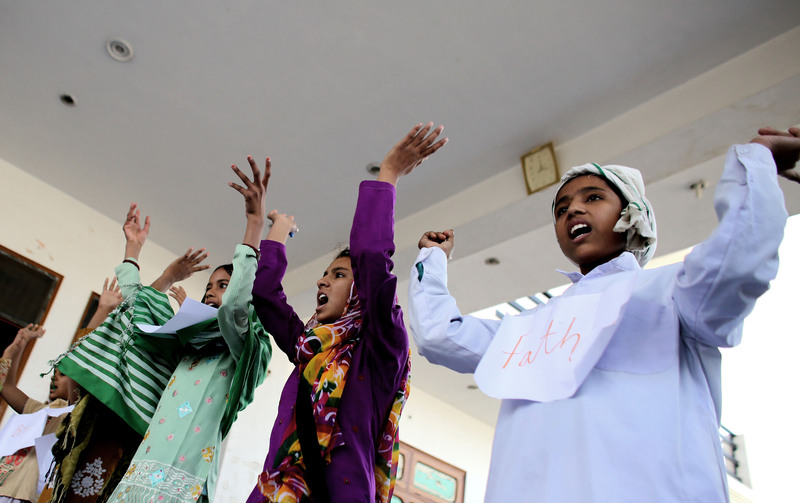 The girls express their feelings about education through a play that explains how their “bridge” school functions. Each of the girls is wearing a paper banner displaying words that indicate her role: father, mother, teacher, outreach worker and village elder. As the American visitors sit cross-legged on the carpet, the performance begins with an outreach worker visiting a Muslim family in the village. “Wife, come here,” shouts the girl who is playing the gruff father. Another girl – the wife – enters. “This teacher wants to enroll our daughter in school. We will have to send her for one year into a residential programme,” says the father. “It is only one year. She will learn mathematics and science; and earn money to help your family when she grows up,” says the outreach worker. “Maybe, but she will also learn city values and get spoilt. She won’t respect elders. We cannot get her married,” says the mother. And so the dialogue continues. The play ends with the parents consenting to send their daughter to the school on the condition that they can visit her every week. Educating girls has become the cause du jour, not just in India but all over the developing world. Primary education for all by 2015 is one of the United Nations Millennium Development Goals. According to a UN Development Programme report, India’s progress in education for all is “on track or fast, considering all indicators”, partly because India started at such a low base and partly because it seems to be an idea whose time has come. Gender equality and educating girls havebecome priorities in India, and now countless middle-class Indians write cheques to help to achieve these goals. The Indian government and private sector are experimenting with different schemes to improve enrolment rates. In 2004, New Delhi launched one such ambitious scheme. Named after the wife of Mahatma Gandhi, the Kasturba Gandhi Balika Vidyalaya (KGBV) was initiated in reaction to high female dropout rates in middle schools – only three out of 10 Indian girls finish school. While dropout rates for girls from primary schools is 45 per cent, the number is worse for middle and high school, where 73 per cent of girls drop out. The reasons are manifold: some parents stop sending their daughters to school after they reach puberty; other girls stop attending because schools have poor toilet facilities; many girls have to walk long distances to reach schools and get harassed along the way; parents often cannot afford books and school uniforms; and mothers use their daughters as proxies to take care of younger children when they work in the fields. The only problem is that KGBV doesn’t address the problem of primary school girls dropping out – or, for that matter, not even enrolling in the first place. While the 74 per cent literacy rate in India is lower than the global average of 84 per cent, female literacy stands at a much lower 65.47 per cent. In her paper, Girl Education: A Challenge for Rural Transformation in India, Dr Swaleha Sindhi, an assistant professor at Maharaja Sayajirao University of Baroda, states that parents perceive the cost of education and its future benefits differently for boys and girls. Poor, rural families who cannot afford schoolbooks or pencils have to choose between their male and female children. This is where NGOs such as Udaan step in. They provide “bridge” education that can funnel the girls into KGBV schools. Established in 1999 and piloted in the Hardoi district in rural Uttar Pradesh, Udaan’s programme takes in 100 girls and puts them through an accelerated learning programme. It covers the syllabus of grades 1 through 5 in just 11 months, a testimony to the power of what an intensive educational programme can accomplish. Once the girls finish the residential programme, they are funneled into the KGBV government programme. The goal is that through these programmes, the girls will finish high school. And they do: in the last nine years of the programme, 98 per cent of Udaan students finished their 11-month residential course, and 80 per cent continued their education. While building new “bridge” schools is one approach to addressing the problem, strong emphasis must be put on utilising existing resources, says Safeena Husain, who in 2007 launched Educategirls, an NGO that works with 5,000 schools across Rajasthan to improve gender equality and female literacy. With a broad base of supporters, Educategirls leverages existing village resources to create “community ownership for school reform”, says Husain. The NGO has trained 1,500 youth leaders called Team Balikas to act as catalysts for and champions of female education. These team leaders liaise between the girls and the schools, trying to solve the problem from both sides. Even small interventions such as a installing separate toilets for girls can make a difference in enrolment and retention. “India is at the epicentre of gender disparity in education, with almost 3.7 million girls out of school,” says Husain. “Going forward, I see more communities realising the benefits of girls’ education and increasingly seeking improvement in their own schools.” Nanhi Kali, another NGO focusing on girls’education, has adopted a sponsorship model – covering each girl’s entire education costs including schoolbag, uniform, books and pencils. 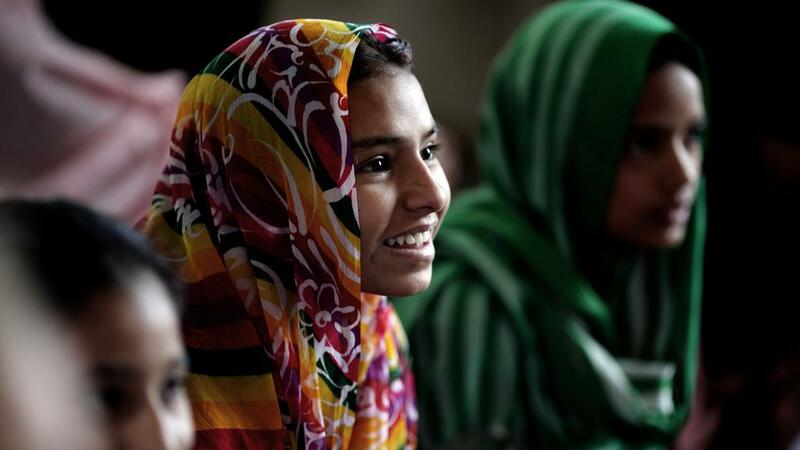 The NGO holds after-school classes and works with girls’ parents to reduce the likelihood that they will drop out. Approaches to addressing gender inequality and female illiteracy may vary, but one thing most can agree on is that educating girls will have a broadly positive impact. Shoba Narayan is a journalist based in Bangalore, India, and a regular contributor to The National.